A wild and wet adventure! 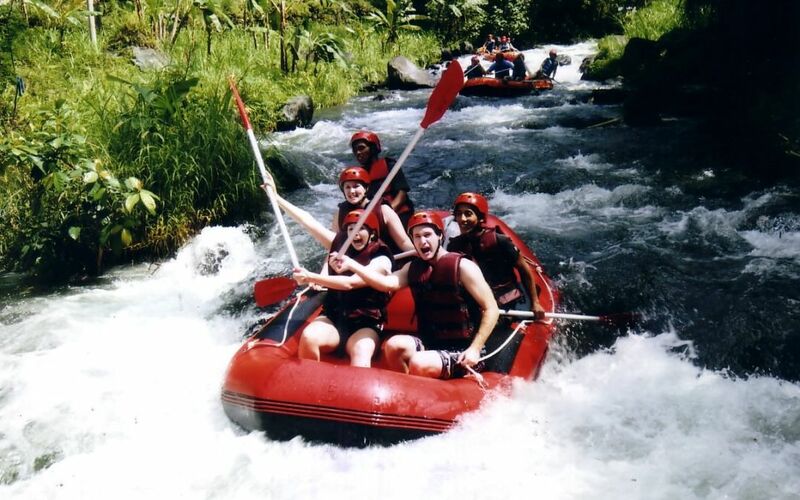 Get the adrenaline pumping on this exhilarating river rafting tour that takes you along a scenic 10-kilometre stretch of your choice of the beautiful Telaga Waja River, or the Ayung River. The trip lasts approximately two hours and takes you along twists and turns, over gushing rapids and past some of Bali’s most beautiful scenery like soaring cliffs, pristine rainforest and sun-dappled riverbanks. We will pick you up in the morning and leave for the starting point. After a briefing by our professional instructor, we will row down a 10 – 12 km stretch of river, passing stunning waterfalls, lush greenery and a myriad of birds flitting through the jungle canopy. After the white water rafting trip, we will have a hearty Balinese feast of delicious local dishes for lunch. Transport rates and times vary by location, and are added to the rafting cost. Send us a message with your preferred date to see if there is a group you can join!